This article is the first in a series that explains the way I’ve decided to lighten my load for weekend backpacking. 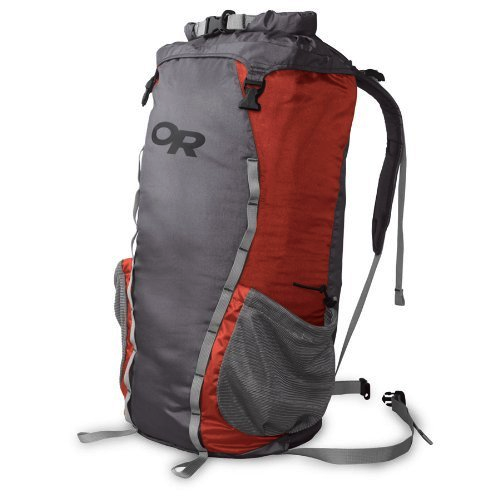 What pack do I use to stay under 16 ounces and keep my gear dry? The Outdoor Research DryComp Summit Sack is an ultralight backpack that keeps your clothes and sleeping bag dry. The Hydroseal-coated Antron nylon is seam taped to make it fully waterproof. To further compress the sack a roll-top closure holds out moisture and compression straps shrink your load. People have used this product for emergency flotation (YMMV). Ergonomic design fits flat against back, four compression straps convert to shoulder straps and hip belt, foam-padded shoulder straps wrap over shoulder. The total pack weight will be <15 pounds when loaded. The shoulder straps are not a problem with a pack this light. It has a large enough capacity that it will easily hold three days of supplies. At $50 this piece of Ultralight kit is EXTREMELY affordable.